The Twins have fielded a terrible roster for years while awaiting the arrival of Byron Buxton and Miguel Sano. Both prospects are poised to contribute at some point in 2015, although a 2016 debut remains possible. Offseason additions have improved the club's pitching depth. Unfortunately, we're looking at a high floor, low ceiling team. They probably won't win fewer than 70 games, but it would be shocking to see them win more than 81. The offense was surprisingly good last year. It could happen again. The Twins wisely extended Hughes this winter after a breakout 2014 campaign. His 3.52 ERA wasn't all that impressive, but his 7.98 K/9 and 0.69 BB/9 hint at better things to come. A popular ERA estimator (FIP) rated Hughes as the sixth best starter last season. It's hard to project another sub-1.00 BB/9. While it's clear he made improvements to his command and control, statistical regression is very likely. Most projection systems anticipate about 7.70 K/9, 1.15 BB/9, and a 3.70 ERA. Those are useful numbers, but hardly elite. Projections take multiple years of past performance into account. If you believe he truly turned a corner, you can give his numbers a small nudge. For what it's worth, I'm buying. So are NFBC owners. He's being drafted as the 44th starter – one spot ahead of Mat Latos. After settling for a one-year deal with Atlanta in 2014, Santana posted another strong season. The Twins signed him to anchor their rotation. While not a typical ace, Santana has grown into a reliable workhorse. His fastball and sinker aren't impressive, but he supplements them with an excellent slider and plus changeup. He gets into trouble when the opposition takes an aggressive approach, which leads to the occasional stinker. He throws a ton of sliders for a starter – over 30 percent – which is linked to increased injury risk. He's one of the few guys who suffered an elbow injury and recovered with rest and rehab. The combination is worrisome. Thankfully, he's generally a late-round pick. He's going right around 300th overall in NFBC. Gibson could be quietly useful as a stream starter. He's sort of a poor man's Doug Fister. His slider improved throughout last season, to the point where he can throw multiple pitches in any count. He gets into trouble when the opposition can sit on his sinker. Alex Meyer is competing for the fifth starter's job. He doesn't pitch deep into games, so he's unlikely to earn the nod. His fastball runs 93 to 98 mph and could play up in relief. The Twins need starting pitching, so they'll do what they can to develop him as a starter. If he lands in the bullpen, he'll be closing games before long. Trevor May has a decent repertoire with bad command and control. If he ever improves his feel for pitching, he could be a viable mid-rotation guy. He doesn't strike me as the sort who improves in a bullpen role. The Twins bullpen is something of a mess, but Perkins remains a useful fantasy asset. He's currently slowed due to a minor oblique injury. He also sat out most of September with a “nerve injury and forearm strain." The club tried to bring him back once, but the injury recurred. It's cause for concern, but it's also holding down his draft day cost. In NFBC drafts, he's selected as the 17th reliever between Fernando Rodney and Sean Dootlittle. Perkins is a southpaw who leans on two pitches – a fastball and slider. Pitchers who throw a lot of sliders have an elevated risk for forearm injuries. It could be correlated to his trouble last year. If Perkins crashes, there isn't anybody to pick him up. Fien appears to be the eighth inning guy. He's a command and control type. Fantasy owners in K/BB leagues probably have some familiarity with him. He has minimal value in standard 5x5 leagues – even if he's earning saves. He's a good bet for 20 holds if Perkins stays healthy. The Twins lineup is a strange beast. They were deceptively good last year, scoring the seventh most runs in the league. Career years from Kurt Suzuki, Brian Dozier, and Danny Santana offset a poor performance from Joe Mauer. Everyone but Josh Willingham and Sam Fuld has returned, so they could continue the surprising production. It's easy to write off Suzuki's season as a fluke, but Dozier and Santana require further analysis. Dozier's value comes from volume. He accrued 707 plate appearances in 2014 with a .242 average, 23 home runs, 71 runs, 89 RBI, and 21 stolen bases. He's a high contact hitter, which he achieves by being selective. He loves to pull the ball, which is probably the source of his power and high infield fly rate. He causes consternation because his physical tools don't add up to his production. He could suddenly vanish from fantasy visibility, or he might maintain these numbers for a few years. A detailed analysis reveals both possibilities. Second base is such a thin position. Even a bad year won't hurt too much. I'm less sanguine when it comes to Santana. He has shortstop and outfield eligibility, which is useful. The .319/.353/.472 line he posted last season relied on a .405 BABIP. He should start the season as the leadoff hitter. When you dig into the details, you see why the projection systems estimate a .265/.300/.375 line this year. He'll still swipe 20 or 30 bases if he's playing, which leaves him with a high floor. He's kind of like Leonys Martin except with more strikeouts and shortstop eligibility. NFBC drafters agree – he's being selected one round ahead of Martin. The Twins double-jumped Kennys Vargas from Double-A to the majors. He looked overmatched at times, yet still managed a .274/.316/.456 line. He makes incredibly loud contact, which could support a high BABIP. The switch-hitter rolls too many grounders for a plodding designated hitter. There is reason to expect continued growth at the major league level. He consistently improved his contact rates in the minors. We'll see if he maintains the trend. He's available late in the draft – around pick 280. 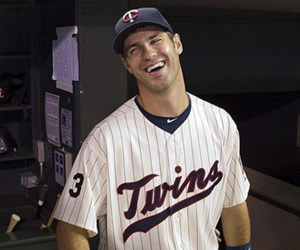 Now that Mauer is a first base only hitter coming off a bad season, he's completely forgotten in drafts. He's going just ahead of his teammate Vargas. He had a normal offseason workout routine for the first time in years. Don't be surprised if he contributes to batting average and RBI. You could do worse for a cheap utility bat. The Twins rank 27th in our power rankings because they lack star power. The club actually performed relatively well last season, although some of that production looks fluky. Some of those seemingly lucky players like Dozier and Santana remain valuable fantasy assets despite the potential for decline. A fast start for Buxton or Sano could result in a climb up the rankings. Minnesota has a couple useful starters and a few sleepers like Mauer and Vargas. The bullpen appears to be a mess. Their only good reliever is an elevated injury risk. They'll lose a lot of games in the middle innings.